The most feature-rich of the three is the Hero7, with features such as Live Streaming, TimeWarp Video, SuperPhoto, Improved Audio, and Face, Smile and Scene Detection, and will retail for Rs 37,000. American technology company GoPro, which is trying to make a comeback, has refreshed its action camera line-up. 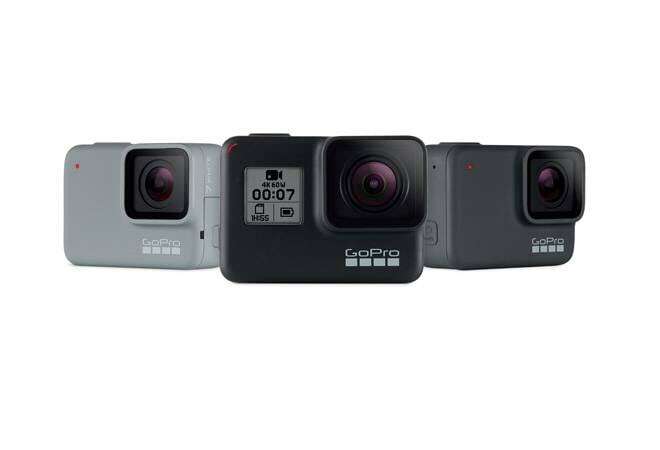 Under GoPro Series 7, the company has unveiled three new action cameras - Hero7 Black, Hero7 Silver and Hero7 White. The most feature-rich of the three is the Hero7 Black, with features such as Live Streaming, TimeWarp Video, SuperPhoto, Improved Audio, and Face, Smile and Scene Detection, and will retail for Rs 37,000. The Hero7 Silver and the Hero7 White will be priced at Rs 28,000 and Rs 19,000, respectively. The new models will go on retail across the global markets including India on September 27. GoPro Hero7 Black features a new technology called, HyperSmooth, which makes it easier to capture professional-looking, gimbal-like stabilised video without a motorised gimbal. This technology works underwater and in high-shock and wind situations where gimbals fail. Hypersmooth is GoPro's new sophisticated digital image stabilisation technology. Another new feature onboard is the TimeWrap video, which applies a high-speed, 'magic-carpet-ride' effect to long experiential videos to make them short and engaging. HERO7 Black can also be used to live stream videos on Facebook, Twitch, YouTube, Vimeo and other platforms internationally. Other features include superphoto for intelligent scene analysation to get professional-looking photos via automatically applied HDR, local tone mapping and multi-frame noise reduction; Portrait Mode for native vertical-capture for easy sharing of Instagram Stories, Snapchat and more; enhanced audio; short 15 or 30 seconds clips for faster transfer to phone and, countdown timer for convenient selfies and group shots. The camera features a 2-inch touch display and supports auto transfer to phone view GoPro app. "Hero7 Black is the GoPro we've all been waiting for," said GoPro founder, Nick Woodman. "With HyperSmooth video stabilisation, Hero7 Black is a camera anyone can use to capture amazingly smooth, professional looking shots of their favourite activities. And they can do it live." With the launch of Hero7 Silver and Hero7 White, at a slightly affordable pricing, GoPro is making its cameras accessible to all, including entry-level, mid-level users and even the first-time action camera buyers. Both cameras are waterproof up to 33 feet and the Hero7 Silver supports 4k video resolution, while the Hero7 Whit 1080p. The cameras have a design similar to the old products by the company and come with a shutter button, a quick camera turns on, a capture button and also support voice commands. GoPro claims that both the cameras feature significantly improved video stabilisation, making it easier to get great looking shots on-the-go.